LPD Servers listen on port 515 by default, so Administrators must ensure that this port is open to requests from clients (check that the port is not blocked by your firewall). The installation wizard also checks for previous versions of the Windows LPD Server, and disables these to ensure there is no port conflict. If this queue services a single account, enable the Override user-level settings at a given queue and charge all jobs to a given shared accountA shared account is an account that is shared by multiple users. For example, in business, shared accounts can be used to track printing costs by business unit, project, or client. Organizations like legal firms, engineering firms, or accounting offices often have long lists of accounts, projects, clients, or matters. In a school or university, shared accounts can be used to track printing by departments, classes, or subjects..
You must share the printer before being able to connect to it using LPRThe Line Printer Remote protocol (LPR) is a network protocol for submitting print jobs to a remote printer. A server for the LPD/LPR protocol listens for requests on TCP port 515. A request begins with a byte containing the request code, followed by the arguments to the request, and is terminated by an ASCII LF character. An LPD printer is identified by the IP address of the server machine and the queue name on that machine. Many different queue names may exist in one LPD server, with each queue having unique settings. The LPR software is installed on the client device.. This is different to Microsoft’s implementation, but provides an extra level of control over which queues can be printed to using LPR. The PaperCut LPD Service accepts inbound print data over TCP/IPv4. The PaperCut LPD serviceThe PaperCut Line Printer Daemon (LPD) service allows continued use of the LPD protocol (Print Services for UNIX, TCP/IP Print Server, LPD Print Service and more) now that Microsoft has removed the LDP protocol from Windows Server 2012 onwards. does not support data over TCP/IPv6. The PaperCut LPD service records routed print jobs in the Windows Application Event log. PaperCut LPD responds to LPQ commands with "OK". No pending print job information is revealed. 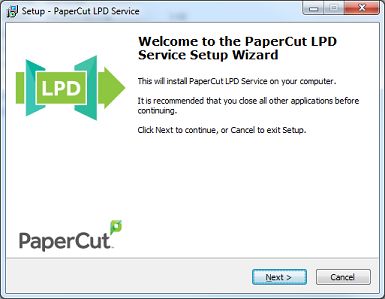 For customers currently using the Windows LPD Service, installations of the PaperCut LPD Service should not require any changes to the client. The address of the server running the PaperCut LPD Service. The name of the queue: either share name or queue name. Some print systems (e.g. CUPSCommon User Printing System (CUPS) is a printing system for Unix operating systems that allows a computer to act as a print server. A computer running CUPS is a host that can accept print jobs from client computers, process them, and send them to the appropriate printer.) do not allow spaces in queue names, so a share or queue name that does not include spaces improves the likelihood of connection. Click the IP tab at the top toolbar. From the Protocol list, select Line Printer Daemon - LPD. In Address, enter the IP address of the server hosting the printers. In Queue, enter the printer's share name. In Name, define a user friendly name; then select the printer type. Select the driver or printer model from the list; then click Add. Log in to the CUPS Administration UI. Click Administration > Add Printer. 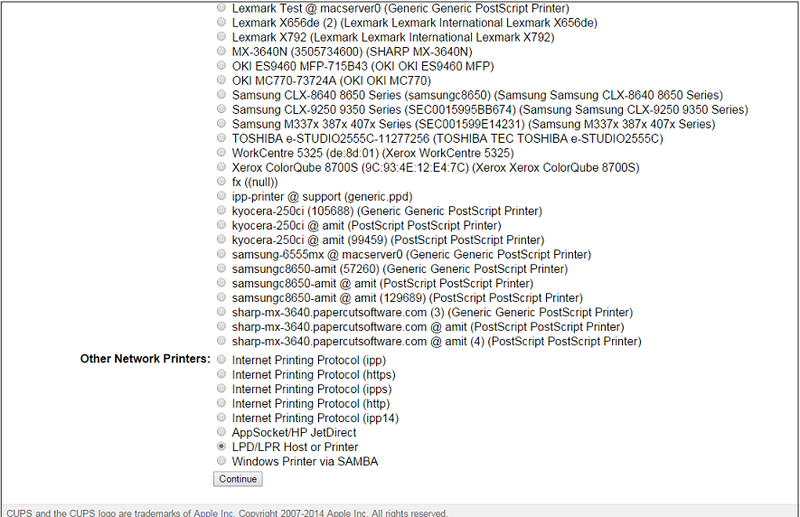 Scroll to Other Network Printers; then select LPD/LPR Host or Printer. Enter in the Connection string using the example format on the page. i.e. Queue Name — either the share name or print queueA print queue displays information about documents that are waiting to be printed, such as the printing status, document owner, and number of pages to print. You can use the print queue to view, pause, resume, restart, and cancel print jobs. name on the print serverA print server is a system responsible for hosting print queues and sharing printer resources to desktops. Users submit print jobs to a print server rather then directly to the printer itself. A print server can be a dedicated server but on many networks this server also performs other tasks, such as file serving. For CUPS the queue name cannot contain spaces. Create the CUPS queue by entering in the rest of the required information, such as Name, Description, Location etc. Choose the driver; then click Add Printer. Print jobs are accepted by LPD into the Windows printing system.